Let’s go a little retro today shall we? Wow, we have the cutest set to show off today! It’s called Kitschy Kitchen. It’s full of the cutest little animated kitchen things and punny sentiments that really make a fun statement. There’s just something about this set that totally inspires a retro feel, so that’s what I tried to do. I coloured up our little spooner with Copics on Neenah cream card stock to match these fabulous papers I had in my stash, Cosmo Cricket Early Bird. I love an aqua and red palette, to me it says 50’s kitchen wallpaper :) So, on the background layer I wanted to capture that wallpaper feel stamping elements of the set in the different colours. I coloured up my ric-rack with my Copics to match and then added those awesome Nested Hearts CutUps Dies to accent with a couple of enamel dots. Super fun and simple too. Here’s the Copics I used for the design. Are you In it to Win It???? 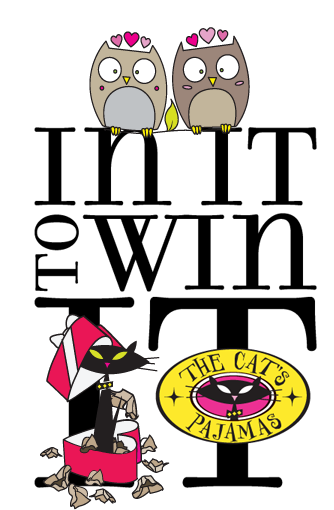 You could win a $10 TCP voucher just by commenting on The Cat Pack’s Blogs! 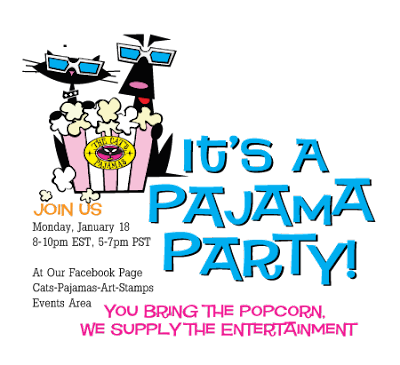 Alma will pick a random commenter each day and the winner’s will be announced on our TCP Facebook Page and the TCP blog. I adore that stamped background - you have captured the retro theme perfectly. Love your paper, if it hadn't been so perfect for this set, mine would still be untouched. 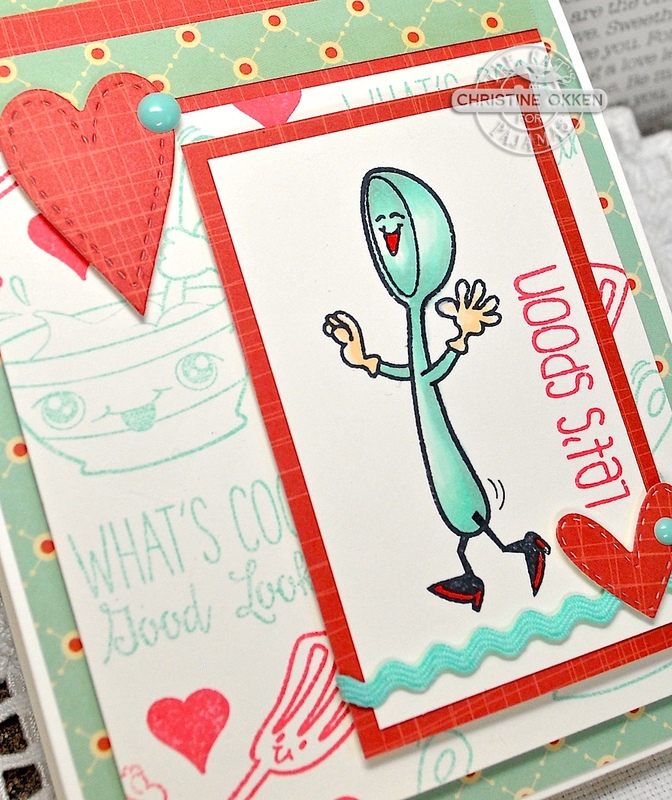 I love your stamped background! Such a fun card! I love your pretty color palette! Adorable and fun! Yep, Fab 50's diner was my fist thought... terrific!! That spoon's smile is contagious! So cute! Adorable!! Love that spoon and your homemade background. Christine, this is the cutest idea. Love this set. Oh I love the colors and the images stamped on the background paper! Super-duper fun! 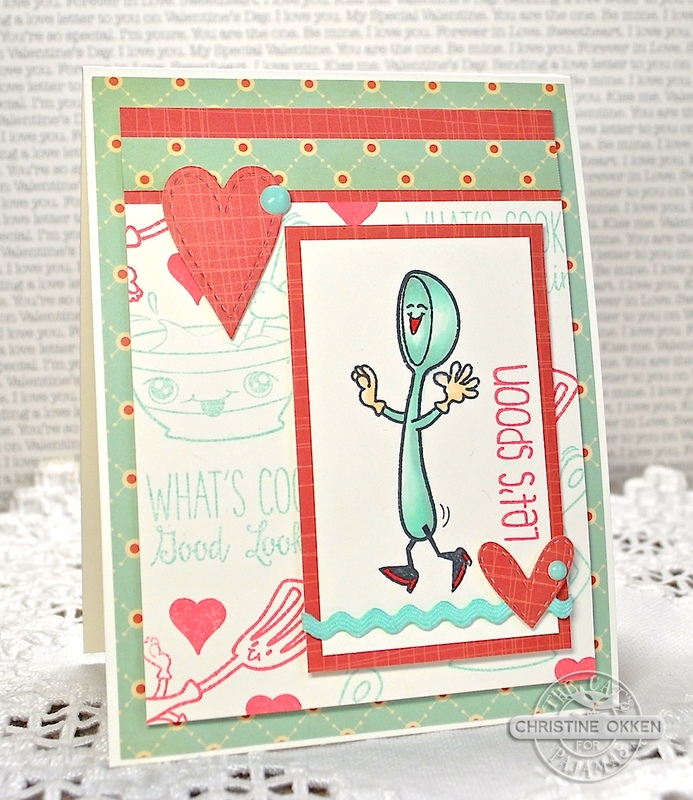 I loved the stamped background! Way to pull it all together! Great card, Christine! The Cosmo Cricket paper was a good match. I had to look close to see that YOU did one of the background papers too - it looked like part of the collection. Love your spoon image - it's "the cat's pajamas." eek! I just noticed the background you stamped. SOOO amazing! What ink did you use?